RMB676 per Adult. RMB238 per Child (6-12). In preparation for the Easter Sunday brunch, the culinary team at Grand Brasserie of the Waldorf Astoria have been hopping around the kitchen, creating delicious themed dishes for guests to enjoy. 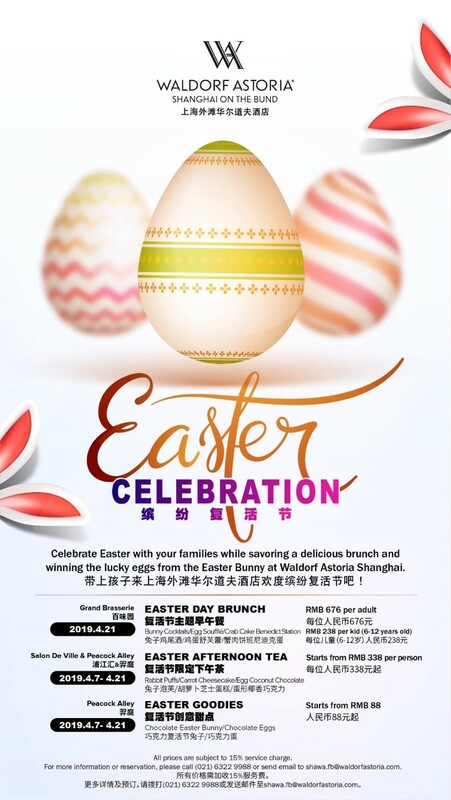 On April 21, experience this farm-to-table-inspired Easter Brunch, featuring festive decorations, incredible service and a wide range of amazing seasonal specials. To celebrate, the team have prepared a creamy Crab Cake Benedict with fried fresh crab cake, poached organic eggs, spinach and Hollandaise sauce, as well as a selection of seasonal vegetables, cute bunny cocktails, an egg soufflé station where guests can enjoy freshly-made and incredibly fluffy strawberry and mango soufflés, and a whole range of amazing buffet and a la carte options.